In 1852 two primitive batteries were built on Browndown Point at Stokes Bay. 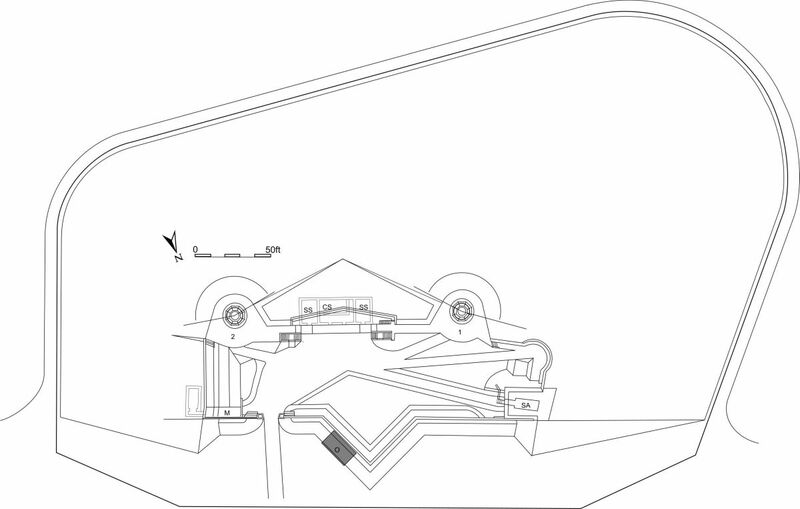 They consisted of prepared positions for movable guns behind earth parapets. 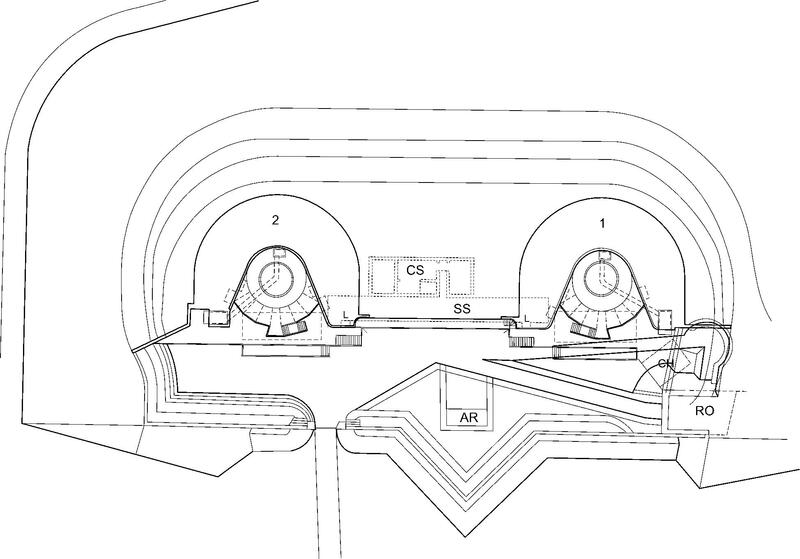 According to an armament list of 1860 Browndown Battery East had positions for 3 x 68pr of 112 cwt. 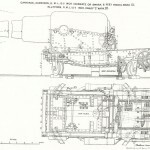 and 7 x 8-inch of 65 cwt. whilst Browndown Battery West had positions for 3 x 68pr. and 8 x 8-inch. Both batteries were heavily criticised by James Fergusson who proposed a system of moats and ramparts to defend Stokes Bay. As a result Major Jervois designed and alternative Stokes Bay Moat defence scheme with additional gun batteries known as The Stokes Bay Lines. 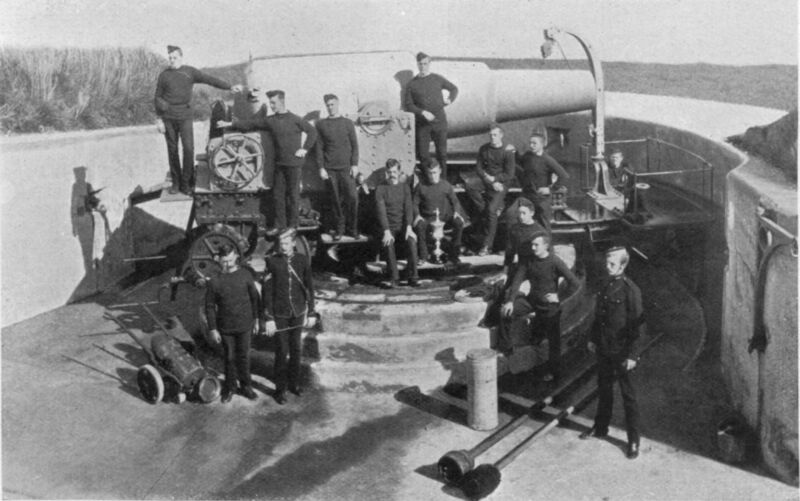 In 1888 the need for two heavy guns to protect the deep water anchorage off Browndown Point resulted in the demolition of Browndown Battery East and the rebuilding of the west one. It was extensively remodelled to mount two heavy 12.5-inch 38 ton Rifled Muzzle Loading guns on the terreplein in open barbette positions. These were paid for at a cost of £6,000 under the Imperial Defence Loan. 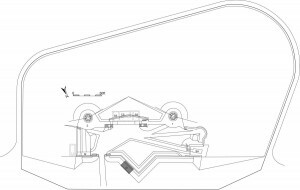 Underneath and between the two gun positions were the usual shell and cartridge stores with ammunition lifts to the gun positions. 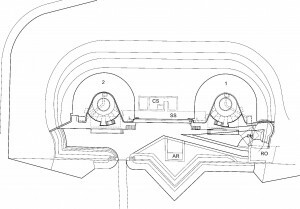 The rear of the battery was closed by a loopholed brick wall, the centre of which projected northwards (landwards) to form a ‘V’ shaped defensive structure known as a redan. Shortly after completion a small barrack room for two officers and servants was constructed against the gorge (rear) wall. Soldiers to man the guns were quartered in nearby Fort Gomer. 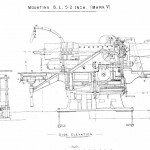 The guns were still in position in 1898 when the Montgomery Committee proposed to replace them with two 9.2-inch Breech Loading guns acting as a gun group with two 6-inch guns on nearby Stokes Bay No.2 Battery. 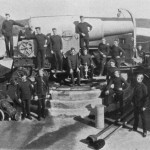 The new battery received its armament by 1904 but was declared superfluous by the Owen Committee in 1905. 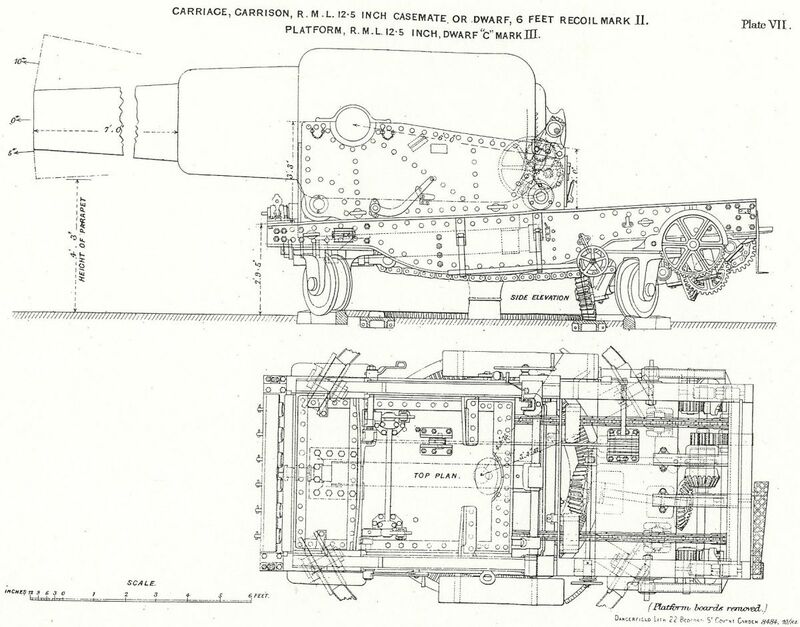 The 9.2-inch BL was considered sufficient for use against Armoured ships up to a range of 6,000 yard. 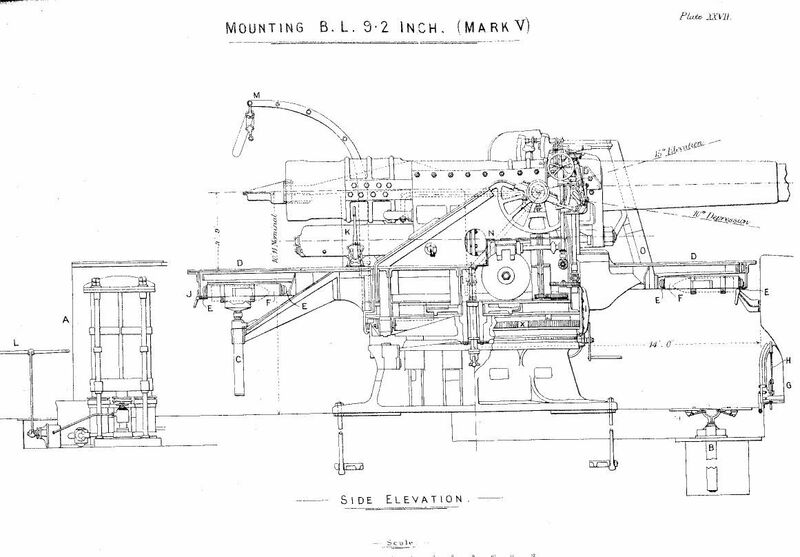 A 12.5inch Rifle Muzzle Loading Gun. A 12.5inch R.M.L. 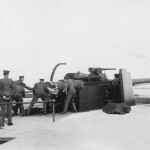 gun of the type mounted at Browndown Battery shown here in action in Cork. 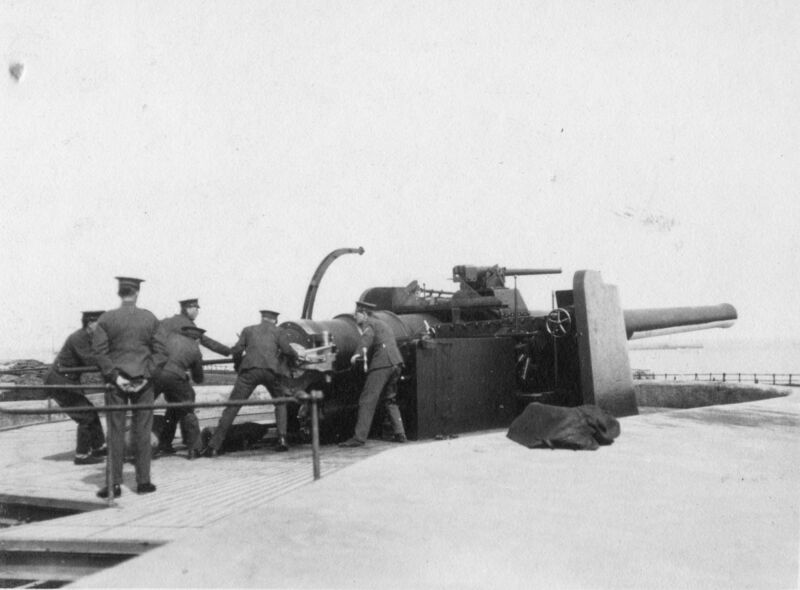 A 9.2inch Breech Loading Gun Mark V of the type mounted at Browndown Battery in 1904. Browndown Battery can still be seen within the perimeter of Browndown army training camp and until the 1990s was looked after by a volunteer workforce of army cadets. Browndown Battery has listed building status. but in not accessible by the public. You can however walk past it when the firing ranges are not in use (i.e. the red flags are not flying). A view of the front of Browndown Battery in 2015. The enigmatic concrete structure, known by locals as ‘The Browndown Mushroom’ is a vent for the storm water overflow outlet that ejects into the Solent offshore at this point.